Who doesn’t love trying new recipes right? It can be expensive if you’re not careful, BUT fear not, we’ve got a way around hefty grocery bills. You simply need to change the way you plan your meals and be flexible about which recipe to try and when. Instead of choosing a recipe and then going shopping based on the ingredient list, have a look at the weekly fliers for grocery stores near you and see what’s on sale. It’s a budget friendly approach to experimenting with new dishes and it’s a great way to inspire you. It’s actually the way chefs plan their menus: based on their freshest produce and using seasonal fruits and veggies. We also love this approach to meal prepping because it can be very overwhelming looking for a recipe to try when there are so many options these days. There are so many magazines, Instagram accounts, websites, food bloggers, TV shows and it’s overwhelming choosing one. This way, you can choose the meat/fish or other ingredients on sale that week and narrow down your search for recipes. It will also push you to buy ingredients you might not have thought of, taking you out of you comfort zone and keeping things exciting. This piece of lamb shoulder is a perfect example. We have never cooked a piece of lamb shoulder but it turns out that when cooked properly (low and slow) it can be very tasty, hearty and economical. This is a perfect recipe to make over the weekend or in a slow cooker. We didn’t have a slow cooker on hand, so we choose to make it the old-fashioned way – in the oven. If you have an oven that you can set to ‘cooktime’ you can replicate a slow cooker recipe. It is foolproof can be made with minimal effort/expertise. It turns out that this is a moist, deeply flavored piece of meat. It is extremely versatile, and a four-pound lamb shoulder will feed 4 people for two meals. Lamb shoulder is cheaper, juicier and easier to roast than leg. Infused with rosemary garlic flavors, it’s not the sort of roast for carving, instead just pull the meat off with tongs. You could make tacos, serve over a bed of creamy polenta or serve with our parmesan smashed potato recipe. Use a thin, sharp knife to make 12 incisions in the lamb, as deep as you can without piercing through the bottom of the lamb. 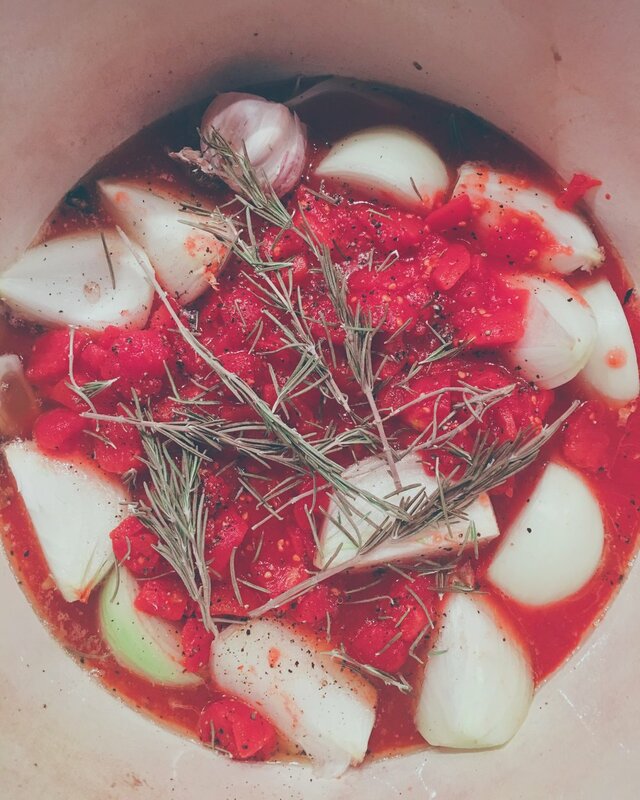 Place the onions, halved garlic bulb, leftover rosemary and tomatoes in the base of a roasting pan. Place the lamb resting on top of everything. Cover with a lid and place in the oven. TURN DOWN to 350F. Remove lamb from the roasting pan and transfer to a plate. Cover loosely with foil and some tea towels (to hold it down and retain some heat). Let it rest for at least 20 minutes and up to a couple of hours. • Place the pan on a burner turn it on to medium heat. 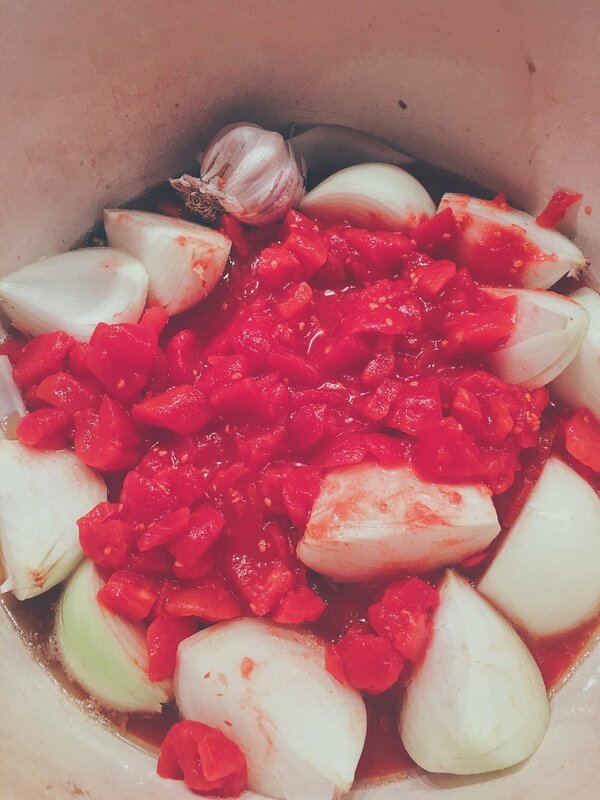 Retrieve the garlic bulb and squeeze out the roasted garlic cloves, stir into mixture and simmer the onions, tomatoes and garlic until thickened. • While the sauce is reducing take two forks and shred the lamb taking care to remove all the bones. You can serve this on a bed of creamy polenta or on Rosemary infused nan bread as we did. 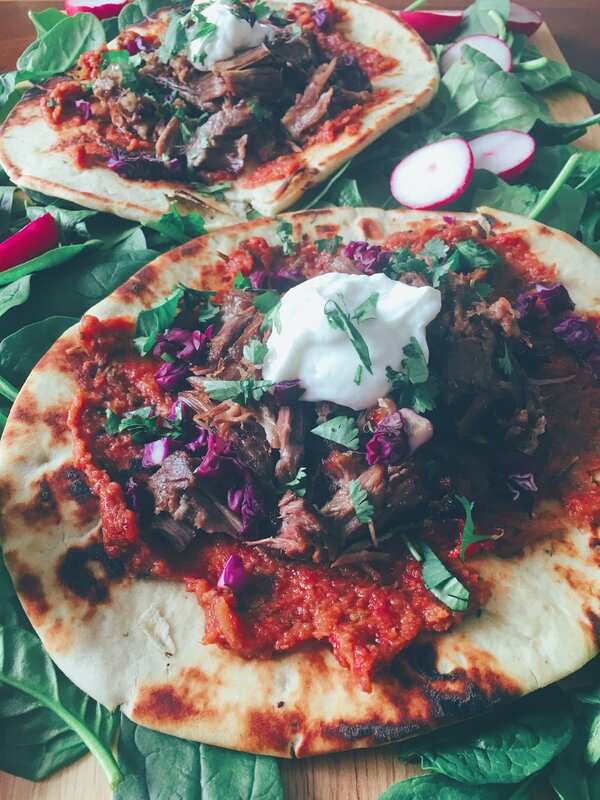 We toasted the Nan, spread a layer of the tomato sauce, piled on the shredded lamb shoulder and topped off with a dollop of Greek yogurt. 2. You'll need to adjust the cooking time for larger pieces of meat. As a guide, add about 30 minutes for each extra 2 lb/1 kg.